Welcome to AllStates Mold Information Center, This page was created with the objective to educate as well as help you in your existing mold and mildew situation. Our objective here at AllStates Restoration is NOT to sell you though but rather EDUCATE you on mold Inspection, testing and remediation. 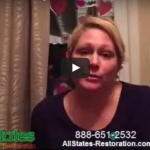 We at AllStates Restoration want to support and help you in your difficult time of mildew and mold remediation. Please call for a free phone consultation. Many mold removal companies charge a fee for a mold report and proposal. Our free phone consultation and mold inspection that includes recommendations, protocol, and information on mold.